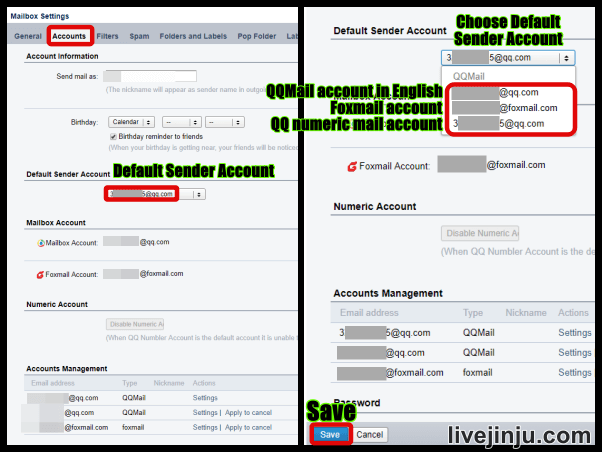 Some people might know a email feature named email alias , we could find this great feature on Gmail, Outlook mail, Yahoo mail and lots of mailboxes , recently , I’ve found that we can Add QQ email alias to strengthen your QQMail account , it’s quite easy to Create QQMail alias , please follow below steps to do it! 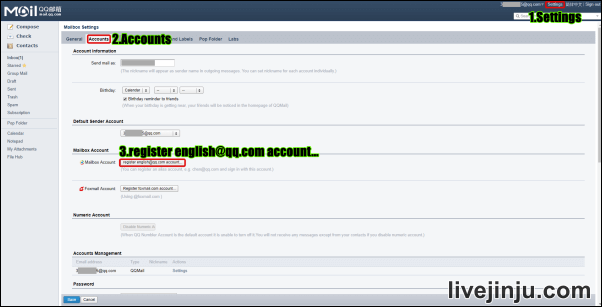 To create your QQ mail alias , we need a QQ account , if you don’t have it, please refer the link below to register your QQ account . 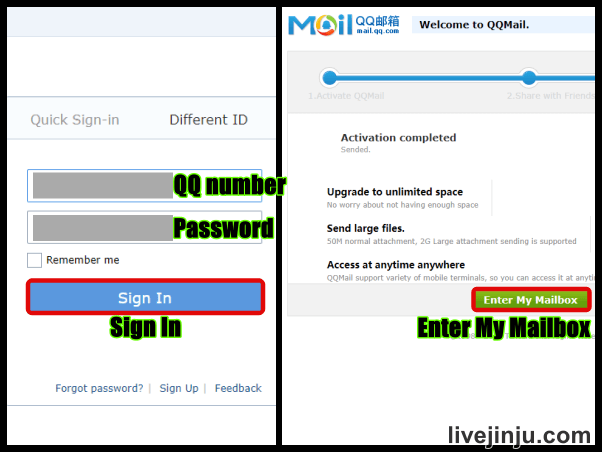 ▼ Following the tutorial to register your QQ account , and you will get your QQ number , on the next step , we will log in QQmail with your QQ number and password. 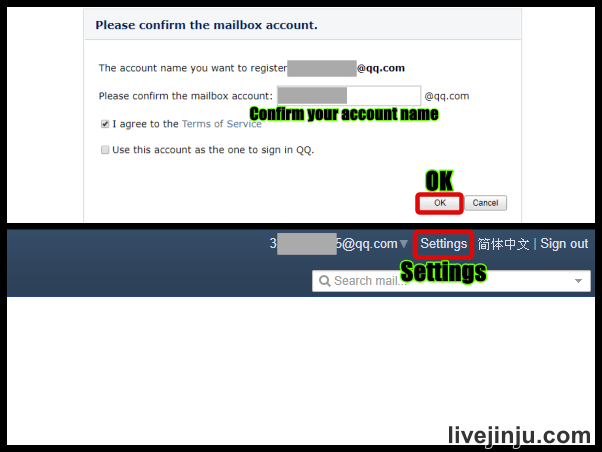 ▼ Logging into your account , if you’ve never used your QQMail before , you would need to activate your QQMail here , it’s easy to activate QQ mail by following the instruction on the page , then click “Enter My Mailbox” to enter QQMail . ▼ Entering QQMail , we click 1.Settings at the upper right corner , then select 2. 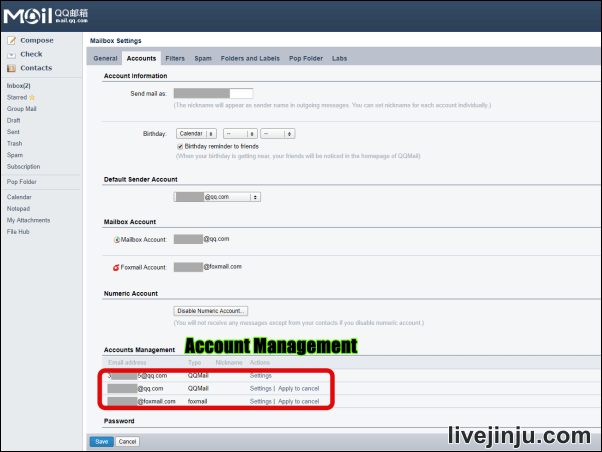 Accounts , next , clicking 3. register english @qq.com account…. to create QQ mail alias in English ( domain name : qq.com). 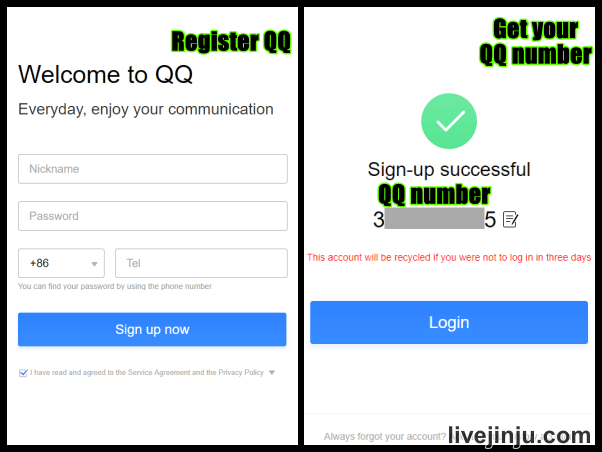 Your default mail address is your QQ number@qq.com , it is a numeric email address , and here we are going to register a username contained with digit and alphabet. ▼ Pressing “Next” to proceed , and entering account name in the field , you could Check availability to see if the account name is available , then Next. 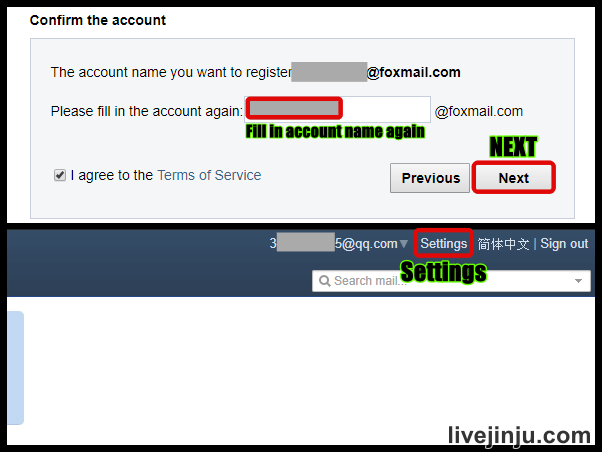 ▼ In the following page , confirm you account name and fill it in the blank , then click OK , and your new QQ email alias is done , next , we click Settings at the upper right corner to set up foxmail email address. ▼ Clicking 1.Account and 2. 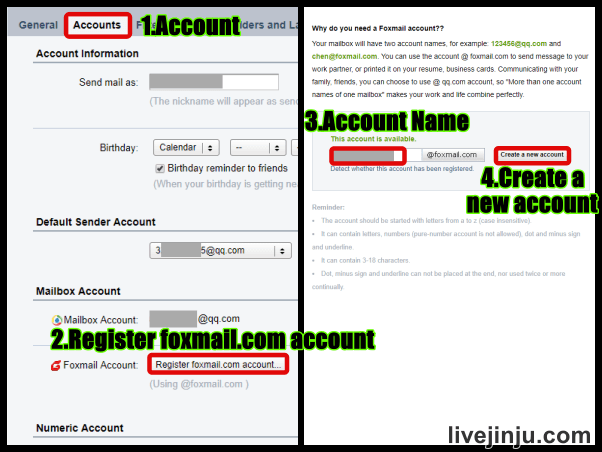 Register foxmail.com account , we are going to register foxmail email address this time (domain name : foxmail.com ), type in your 3. Account Name , then click “4. Create a new account“. 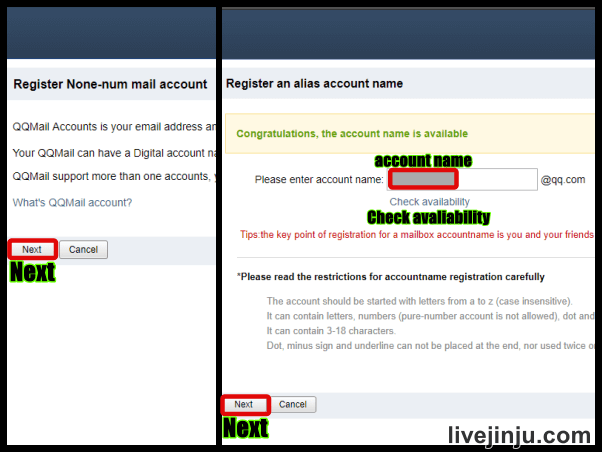 ▼ Also confirm your account name again and fill in your account name , then press Next , and your foxmail address is created ! Same clicking Settings to open setting page. ▼ We’ve created two more email alias successfully , and you can choose your Default Sender Account in Account Settings, then Save. 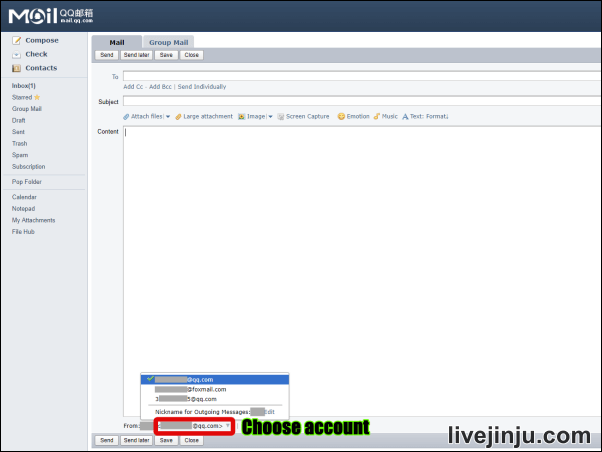 ▼ If you would like to manage these email address (alias) , you could find it in Account Management , we can set up different nickname and signature for each alias , or delete(Apply to cancel) email alias here. ▼ Created your email alias , you can start to use them to send your E-mails in composing mode . 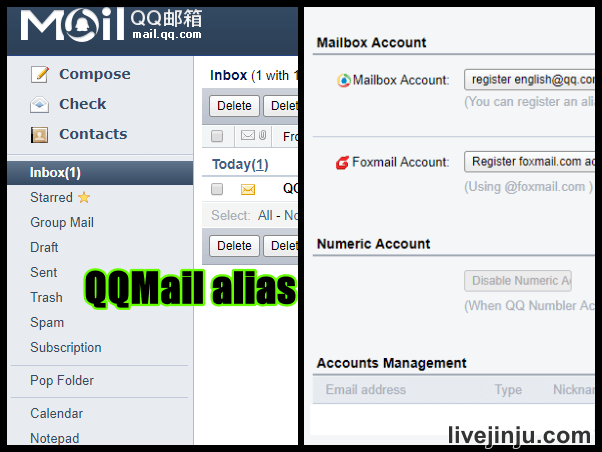 Adding more email aliases to your QQ mail account , you could use these aliases on different places , English QQ mail account and foxmail mail account also look more formal than the numeric one , hope you enjoy your new QQ mail aliases , if this works for you , please SHARE it, thanks!